The Mokelumne Wilderness is one of my wife's (Luthien) favorite places to visit. Geographically, it straddles the crest of the Sierra Nevada between Highways 4 and 88. More than just a location, though, it's at the junction of the Northern Sierra, Southern Sierra, and Eastern Sierra botanic provinces. That makes for pleasant hiking through a diverse range of plant communities, which change with elevation, exposure, and soil type. For example, plants in the valleys grow amid slabs of granite, while the peaks and ridges are composed of dark volcanic rock. Perhaps these dark rocks, with their sinister appearance, keep the number of visitors down. I've seen few hikers there compared to nearby areas with carved granite peaks, such as the Desolation Wilderness. It was my usual spur-of-the-moment decision last August to plan another visit to this wilderness area. The plan developed into a moderately strenuous dayhike up to the summit of the 10,011' Raymond Peak. From Sacramento, the closest trailhead is by way of Blue Lakes Road off Highway 88, a few miles east of Carson Pass. I originally planned to start our hike from Wet Meadows Reservoir, "road's end" per my map and the road signs. However, the road continued east, toward the peak, as did we, another half mile to a small undeveloped campsite on a small creek coming down from the saddle ahead. Once out of the truck, we wandered around the creek a bit before finding a spur trail leading east toward the saddle. It joined the Pacific Crest Trail (PCT), to our surprise, a few minutes later at a wilderness sign-in kiosk. After obtaining the self- service permit, we continued a similarly short distance on the PCT up to the saddle. Then, we turned south on a use trail up a gentle ridge before contouring around into the pines. We passed a couple small, but nice campsites, with Pleasant Valley Creek as our left handrail. Eventually we lost the trail while climbing some volcanic rock, taking in the view of a water cascade on the left. Up the ridge on our right was a large natural arch set in a volcanic pinnacle. With our backs to the arch, we crossed the creek and climbed up to a string of volcanic outcrops. Luthien went around to the right while I went left, which put me on the high side of a cliff with Luthien 30' below. Luckily, she was able to scurry up a chimney without too much exposure. We then continued to the left just below more outcrops until my GPS put us just short of the summit. Our luck held as, looking up, a Class 2 route was evident. About three hours after leaving the trailhead, we were having lunch atop Raymond Peak. Below the opposite side of the ridge, an alpine lake set off its surroundings with deep blue. Water is like a magnet to Luthien, so it was easy to rationalize trying a different route out, especially since I figured the PCT must be down there somewhere. So, we changed plans and dropped quickly down an avalanche chute to the lake. There we met a couple fishermen, the only people we saw on this hike. We had better luck than they, since they hadn't seen a fish and we learned of an easy route out to the PCT via a Raymond Lake Trail. After a quick dip in the lake to keep Luthien happy, we found the trail and followed it to the PCT. However, the PCT wound around several water courses, so it was almost four hours before we were back at the truck and on our way home. From Highway 88 a few miles east of Carson Pass, travel south on Blue Lakes Road about 9 miles (half of which is dirt road) to a left turn away from Blue Lakes, where you can follow the signs another 4 or 5 miles to Wet Meadows Trailhead. PCT/Raymond Lake Route - Follow the Wet Meadows trail a couple hundred yards to meet the Pacific Crest Trail (PCT), then continue east on the PCT to a junction with the Raymond Lake Trail. 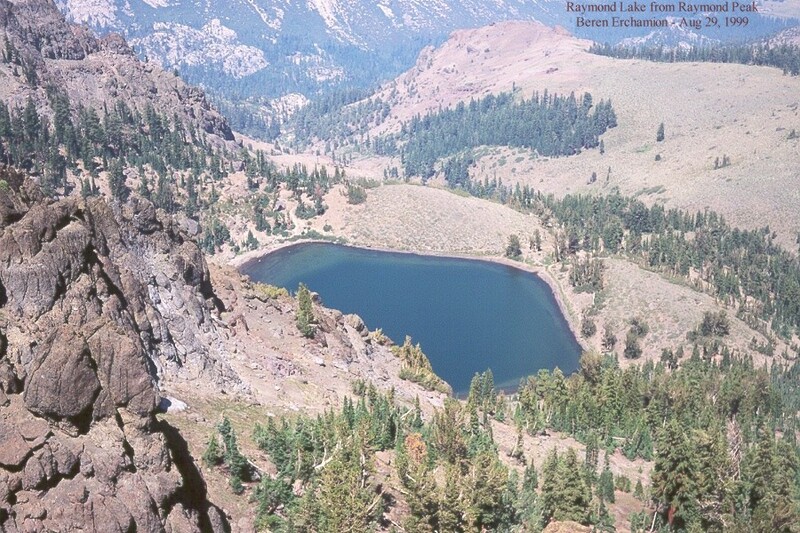 Follow the Raymond Lake Trail to Raymond Lake, then climb an avalanche chute on the east side of Raymond Peak to a point just south of the summit, from which it's an easy walk to the top (coordinates are in degrees-minutes).